Islamo-Fascism and the War Against the Jews: The Black Book of the American Left Volume 4 is indispensable for anyone who cares about the so-called “War on Terror” and identifying who the real enemies are of the United States and Israel — and nothing less than our Judeo-Christian culture and values are at stake. David Horowitz is an unfairly maligned writer by the mainstream press, liberal-leftists and academia in particular, but he is fearless, daring to go right into the “belly of the beast” and speak at dozens of college campuses about topics that opponents cannot refute on the merits, resorting to name-calling, and lying about his facts, sentiments and record instead. This quick reading volume, which contains many short chapters and speeches on Islamo-Fascism, The Middle East Conflict, and the Campus War on the Jews, will horrify readers unfamiliar with how academia perverts the very essence of what the university should stand for: freedom of expression and the open market of ideas. Instead, Horowitz shows how he is consistently vilified and misportrayed- to the point he needs armed guards to even enter assembly halls because of the threatening behavior of Muslim student groups in particular, and even some Jewish ones, who only want to shut him down and brand him a racist hater. Why? Because he challenged them to confront the jihadists (he is not afraid to use proper identifiers), who are in a disturbing alliance with anti-American radicals, who cannot stand his use of concepts to counter their empty cries of “Islamophobia” when he points to Islam’s oppression of women and homosexuals, its true goals of Islamizing the world, creating dhimmis (second class citizens) of Jews and Christians, and ultimately to destroy our freedoms and democracy. Their plans to destroy Israel and deny Jews a sovereign state of their own are shown as naked anti-Semitism. And Israel is merely the canary in the coal mine. Horowitz is a rare, brave and original thinker, and unlike most of his critics, he has the street “cred” to prove it: he himself became a leading Marxist “theorist” in the early 1960s and one of the founders of the New Left. It was after Vietnam, however, that he began to re-examine the damage these views had inflicted upon the country and realized that the Left had left him. But you cannot afford to leave him. This book deserves a serious read by any honest broker. In 1956, Nikita Krushchev, then the leader of world communism, gave what was supposed to be a secret speech about the crimes of Josef Stalin, including millions upon millions murdered. As David Horowitz has often recounted, the page-one publication of that speech byThe New York Times shook American communists to the core. These included such self-styled “Progressives” as Horowitz’s own parents, who were devastated by the news that validated claims long posited by anti-communists of the political right. 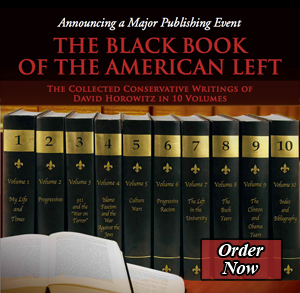 The last of this group, the vanguard of sharia supremacism, is the focus ofIslamofascism and the War Against the Jews, the recently released fourth volume of Horowitz’s conservative oeuvre, the collection called The Black Book of the American Left. In it, the author expertly diagnoses Islamo-fascism, a term he undertook to popularize in 2007, amid the remarkably successful campaign by the Islamist-Leftist alliance to suppress examination of the scriptural moorings of jihadist terror. He also relates counter-offensives executed by the indispensible David Horowitz Freedom Center, taking the battle to the alliance’s home turf, America’s universities. The author also explores the alliance’s war of anti-Semitism – not of anti-Zionism, but an unremitting war of hatred for the Jewish people – the top agenda item of modern Islamo-fascism and the fuel for much of its agitation on campuses across the nation. The neologism “Islamo-fascism” was made necessary by the United States government’s obtuse determination not to acknowledge, much less examine, the ideological basis of Muslim terrorism. This willful blindness has hardened into unbending policy – indeed, into farce – during the Obama years. Horowitz, however, correctly traces its origins to the George W. Bush administration’s preternatural indulgence of Muslim sensibilities even after jihadists killed nearly 3,000 Americans in the atrocities of September 11, 2001. Of course, it was not Muslim sensibilities the administration was seeking to placate; it was the cleverly orchestrated grievance-mongering ofthe Muslim Brotherhood. Since its founding in Egypt in 1928, Horowitz relates that the Brotherhood has been the world’s most influential font of sharia supremacism, sharia being classical Islam’s repressive societal framework and legal code, rooted in Muslim scripture – the Koran, as well as sacralized accounts of the prophet Mohammed’s life, words and deeds. Since the middle of the twentieth century, the Brotherhood has methodically built an infrastructure of satellite organizations in the United States, much of which was laid bare in the Justice Department’s 2007-08 prosecution of a Hamas financing operation, the Holy Land Foundation case. Hamas self-identifies as the Brotherhood’s Palestinian jihadist wing, and support for its war to eradicate the Jewish state has been a top priority of the Brotherhood’s American network since the late 1980s. Among the most significant of the Brotherhood satellites have been the Muslim Students Association (MSA) and the Council on American-Islamic Relations (CAIR). The MSA, which now boasts hundreds of chapters in universities throughout North America, is a Brotherhood breeding ground, indoctrinating students in organizational protocols as well as the virulently anti-Western, pro-jihadist writings of Islamist thinkers. Several top MSA leaders have gone on to become prominent members of al Qaeda and other terrorist organizations. Chiefly, though, the MSA colludes with the left to undermine support for policies that promote American interests in the world and security at home. CAIR was established in the early 1990s because the Brotherhood shrewdly perceived the need for a public relations arm that could, by masquerading as a civil rights organization, leverage American liberties against American interests – not least, the interest in combating jihadism both domestically and overseas. The most effective gambit of the Islamist alliance with the left has been the promotion of an illusion, “Islamophobia.” As Horowitz illustrates, this contrivance was born in Islamist think-tanks for the specific purpose of smearing as racists commentators who engage in negative criticism of Islam – in particular, any effort to demonstrate Islamic doctrine’s straight-line nexus not only to jihadist terror but to the repression of women, the killing of homosexuals and apostates, and deep-seated animus against non-Muslims, especially Jews and Christians. Because these are undeniable features of their scripturally-rooted ideology, Islamists knew it was imperative to discourage public examination of their principles. The “Islamophobia” canard, exploiting the founding American tradition of religious tolerance, was an ingenious strategy to discredit and thus silence the messengers. It worked to a fare thee well. Not only was the examination of our enemy’s ideology vilified on campus and in the media; the government – even as it fought jihadists on the battlefield and prosecuted them in the courts – accepted the fraudulent premises of Islamophobia. Turning for guidance to “Muslim community leaders” (i.e., Brotherhood-connected organizations like CAIR), law-enforcement and intelligence agencies suppressed mention of such terms “Islam” and “jihad” in connection with, well, Islamic jihad. Moreover, as Horowitz shows in various contexts, nothing serves the Islamist-leftist alliance like a vacuum. With examination and discussion of the actual cause of jihadist terror – sharia supremacist ideology – muzzled, Islamists and leftists had an open field to offer their competing version of terrorism’s causes: American support for Israel, American counterterrorism policies, American aggression, American support of pro-Western dictators in Muslim countries, and the lack of social justice, which, of course, we are to believe is the beating heart of Islam. Horowitz’s promotion of the term “Islamo-fascism” was a vital pushback against this onslaught. As he posits, the term “properly identified the religious nature of the jihadist threat along with its totalitarian implications – two hitherto-suppressed realities that were vital to understanding the enemy we faced.” The government retreated from the effort when a single utterance of the term by President Bush produced uproar from the Islamist-leftist alliance. Horowitz decided the best response was to take the fight to the source: the universities where the MSA was succeeding in banning scrutiny of the Islamists’ tyrannical creed. Much of the book details these efforts and the unvarnished anti-Americanism and anti-Semitism they were met with on campuses across the country. At Columbia University, which happily played host to Mahmoud Ahmadinejad – the then-president of Iran with decades of American blood on his hands, Islamists and leftists rabidly protested against Horowitz’s “Islamo-Fascism Awareness Week.” Making space for “Islamophobic” arguments in the marketplace of ideas, they fretted, would prompt “hate crimes” against innocent Muslims and justify America’s wars of “aggression” and “occupation” – not liberation – in Iraq and Afghanistan. Horowitz: … I am a Jew. The head of Hezbollah has said that he hopes that we will gather in Israel so he doesn’t have to hunt us down globally. For it or against it? Horowitz thanked the student for showing anyone who cared to see exactly what is really going on in America’s universities. He could equally well have thanked her for clarifying what the jihad in Israel is really about: not the vindication of Palestinian human rights but the extermination of Jews. For decades, and with singular clarity, Horowitz has exposed what is popularly rendered as “the Israeli-Palestinian conflict.” In reality, it is a continuation of the jihad seeking the Jewish state’s destruction begun in 1948. From the start, Arab Muslim states sought Israel’s annihilation, and the failure to achieve it in a war of naked aggression was considered the nakba – the catastrophe. With the help of the American left, Islamists have falsely portrayed the ceaseless jihad as a political conflict over disputed territory and a struggle against “occupation.” In point of fact, Islamists will be satisfied with nothing less than Israel’s destruction – and leftists with nothing left than the eradication of a liberty success story where Arabs live with more freedom and dignity than in any Islamic state. Israel, Horowitz underscores, is the canary in America’s coalmine. Islamists and leftists seamlessly confederate in the West, notwithstanding significant differences (on, e.g., women’s rights, gay rights, and abortion), because our liberty culture is the chief obstacle to their totalitarian designs. Islamists and Leftists see the war clearly and understand the imperative of keeping us blind, or at least silent. David Horowitz has made a career of unmasking our enemies, who cannot be defeated absent recognition of who and what they are.